A website is seldom built overnight; that’s why a ‘coming soon’ page can be the perfect placeholder to greet your website’s visitors while it’s still being developed. What’s more, it provides other perks such as enabling you to brief visitors about your upcoming brand, collect leads, and build a pre-launch buzz to increase your chances of a successful launch. In this article, we’ll first discuss why using a coming soon WordPress theme is better than using a blank page or static image as a placeholder. We’ll then delve into ten of the best coming soon WordPress themes, and highlight their key features to help you make an informed decision. For the uninitiated, a WordPress coming soon theme is a page that will temporarily display while you’re working on your website. It can include elements such as your logo, an email form for lead generation, a quick blurb about your project, and even a countdown timer to your big launch. In short, think of it as a temporary one-page microsite. While you might think a simple blank page or static image might suffice as a placeholder until your website is ready to shine, a coming soon theme affords you much more flexibility than other alternatives. A good coming soon theme will offer customizations to suit your brand’s identity and voice. It should also provide you with an easy way for your visitors to stay up to date with your website’s progress, learn more about your brand, or simply get in touch with you. Depending on the buzz you’d like to create, you may want to include some of the aforementioned bells and whistles such as animated countdown timers, and an opt-in form that integrates with your favorite email marketing service. Below we’ve selected some of the best coming soon WordPress themes available. The selection criteria was simple: we’ve only chosen those with solid user reviews, responsive support, and of course, a great design. Let’s take a look! Startuply is a theme that offers more than just coming soon pages. The theme’s focus is design: for starters, there are over a dozen pre-built designs to choose from. Alternatively, you could create your own unique layout using the in-built options. Also included is the premium Visual Composer plugin, which enables you to create your website using a drag-and-drop interface, all without touching a line of code. Offers seven homepage layouts, and three coming soon page layouts. Includes over 70 shortcodes to enhance functionality and add new elements. Provides 12 different form layouts with MailChimp integration. Includes the premium Visual Composer plugin. Verko is a theme offering a minimalist design, and features a one-page website layout that’s ideal for a variety of applications such an app launch page or a coming soon page. There are nine layouts to choose from, along with a number of features such as an off-canvas sidebar, a video header option, and much more. Includes the Visual Composer drag-and-drop page builder plugin. Offers customization of a countdown timer, the background, and much more. Comes bundled with a premium slider plugin to display images and other content prominently. 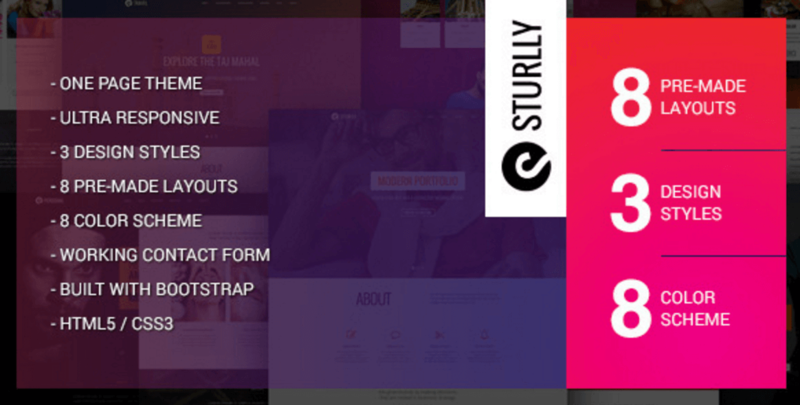 Sturlly is a reliable and vibrant theme that looks professional and solid. Although it’s simple – with similar features to other examples on this list – there’s plenty of power under the hood to create almost any design you like. For starters, the contact forms provide basic spam validation, and there’s also a CSS toolkit included in case you’d like to get your hands dirty with code. Includes a Contact Us and email subscription form, which offers spam validation. Provides a built-in CSS toolkit that enables you to create stunning websites easier and faster. Offers a number of color schemes and design layouts to choose from. Uncode is probably the most feature-rich theme in this list, and much like some of the other solutions, it can offer more than a simple coming soon page. It’s a highly flexible theme that’s aesthetically pleasing and functional, and its coming soon template offers bold headings and a countdown timer to build anticipation for your launch. Provides a flexible, feature-rich admin panel to design your coming soon pages. Includes a plethora of design options to help you achieve your desired aesthetics. Offers a number of built-in layouts and design choices. 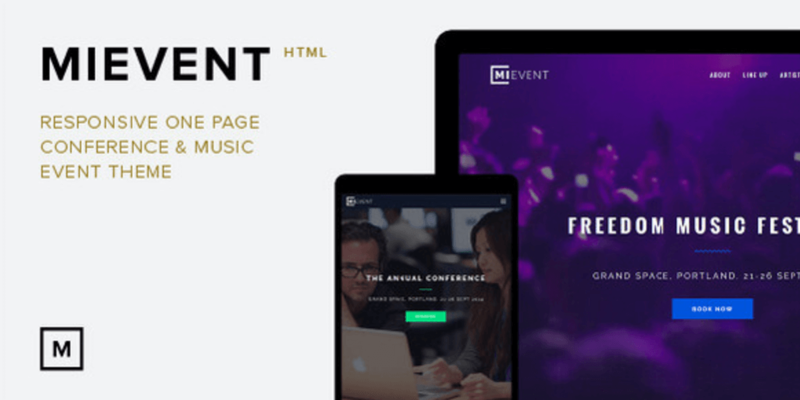 MiEvent is a fresh, modern and professional coming soon theme that caters for events such as conferences and exhibitions. It’s cutting edge, and provides a number of standard features such as a countdown timer, and other more unique elements such as modal dialog boxes for prominently displaying featured information to visitors. Includes a number of pre-built templates to choose from. Offers some unique functionality, such as modal dialog boxes and various pop-up overlay styles. Provides a powerful admin panel to help you design your coming soon page. 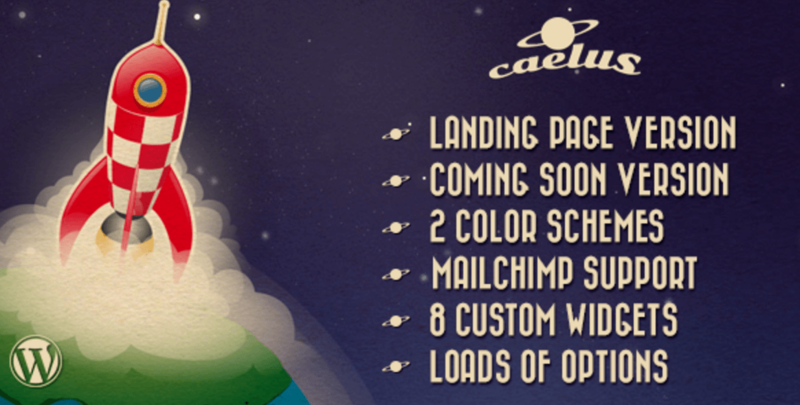 Caelus’ branding evokes the kitsch retro aesthetic that’s become so popular recently. This theme keeps your choices simple, with two styles to choose from, along with four fonts at your disposal. Extensive it isn’t, but it does come with support for MailChimp, along with eight custom widgets. Supports MailChimp to help you collect email addresses. Includes two styles and color choices. Offers an iPhone slideshow option that responds to finger swipes. 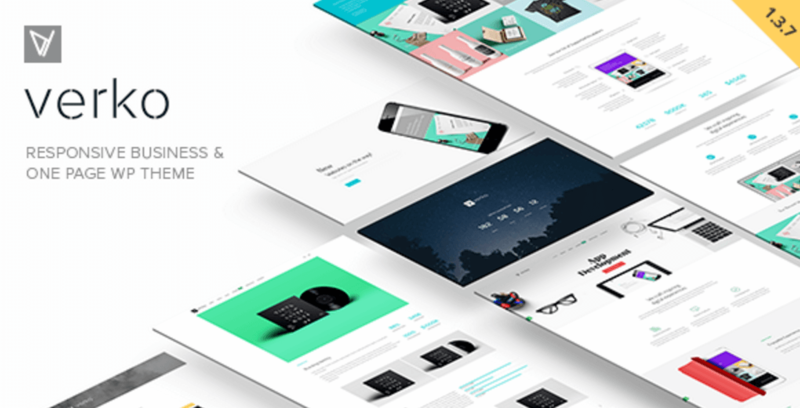 Next up is WooPress – an e-commerce theme that offers a dedicated coming soon template. It’s built to be a modern solution for displaying your coming soon page, with an emphasis on speedy loading and crisp visuals on high resolution devices. The theme is packed with functionality and features that can all be accessed from a dedicated admin panel. In short, it’s a great solution for displaying a coming soon page quickly and effortlessly. Includes a dedicated coming soon template. Provides a number of bundled plugins such as Visual Composer and Slider Revolution. Offers almost unlimited color, header, and footer variations. xLander is a dedicated coming soon theme built on Bootstrap – meaning it’s a modern solution for displaying your coming soon page. What’s more, it can also be used as a landing page, portfolio, or one-page template if you wish. There are over six different layouts and five color schemes to choose from, and the theme includes a number of contact form styles that link directly with your MailChimp account. Includes a number of layout and color styles to choose from. Offers a number of CSS animations to hep enhance your design. Links directly with your MailChimp account to capture potential leads. Price: $39 | More Information. Applay is a slightly different kettle of fish to the other entries on this list, as it’s designed mainly for those who need a coming soon page for their upcoming app. It includes a drag-and-drop page builder to help design your layout, although there are a number of pre-built layouts to choose from. This theme also includes a number of navigation and header styles, and offers some popular design effects such as parallax scrolling, along with a number of fonts and icons. Includes a drag-and-drop page builder courtesy of the Visual Composer plugin. Offers over 400 Google Fonts and icons to choose from. Provides a number of layout styles to help create a unique coming soon page. When it comes to creating a coming soon page, if you’re an Elegant Themes member, you’re in luck! Our Divi theme offers everything you’d want to create both a stylish website and coming soon page. 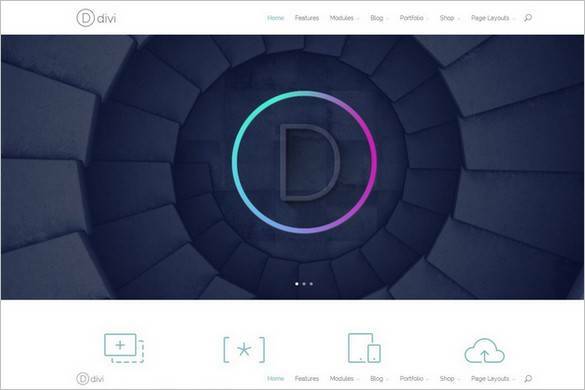 Of course, Divi’s main focus is helping you to create a stellar-looking website with ease. It ships with over 20 pre-built layouts and gives you full flexibility to customize almost any aspect of your site using the intuitive drag-and-drop visual builder – all without code. While it’s simple to create your own coming soon page from scratch using Divi’s modules and the blank page feature, we’ve also previously offered a collection of eight coming soon page templates that are easy to install and fully customizable. Includes over 20 pre-built layouts. Your subscription includes a plethora of other themes and plugins, including our Bloom opt-in plugin (ideal for lead generation). 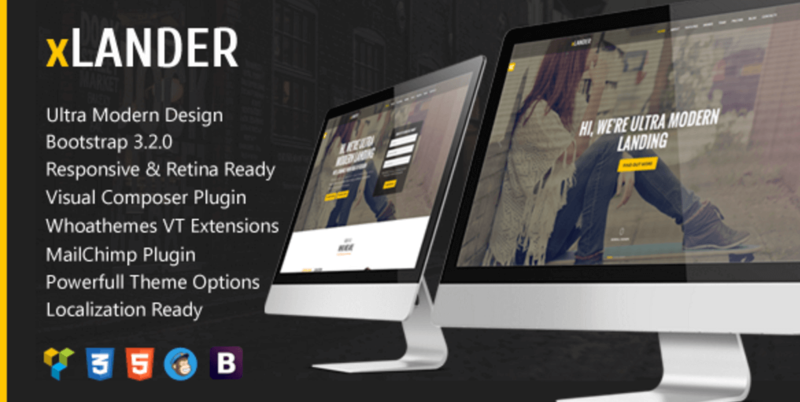 Provides an easy to use drag-and-drop page builder in the form of the Divi Builder. A coming soon theme will likely be your visitor’s first impression of your website and brand, before they exist! It’s also a great way for you to ‘prepare’ your visitors on your upcoming website and project, and create a sense of excitement and anticipation to boot. 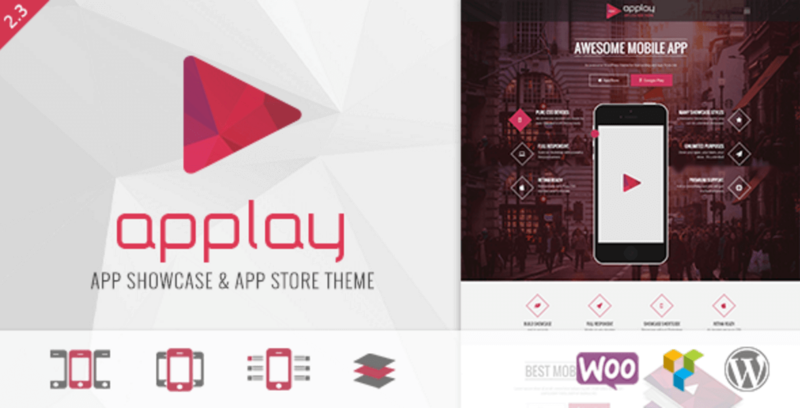 In this piece, we’ve included a number of coming soon themes for all manner of applications. For example, Sturlly and Caelus are good, solid choices, while MiEvent caters specifically to events promotion. However, choosing a multipurpose theme such as Divi will enable you to create your website and display a coming soon page all from one interface. With an Elegant Themes membership, you not only get access to Divi, but a number of other themes and plugins too. Which of these themes would you use and why? Share your thoughts with us in the comments section below! Article thumbnail image: garagestock / shutterstock.com. Nice overview. But a specific coming soon theme only works if you develop the actual website on a different WP installation. Sometimes I work on the same domain and in that case I use the AC Maintenance plugin from ayanize. It allows you to assign any page as your coming soon page (so a Divi design). Logged-in users have access to all pages and not logged in user are redirected to the coming soon page. Works great! Where would I find the AC Maintenance plugin? It is not coming up on WordPress.org. The main disadvantage is letting my customer view the site in progress without giving backend access. I will often deactivate Maintenance for a specific time frame for my client to review the site. Another con is the page design is limited. An advantage is you can activate/deactivate the Maintenance page as needed. If doing major backend work or fixing a problem, you can activate Maintenance page while you work. The plugin Maintenance mode by Designmodo (in WP-repository) has a feature so you can show your customer the site you are working on while the site is on maintenance mode. You can do so by filling in the IP address of your customer in the exclude from maintenance mode screen. Reading your description of the plugin you use I think you are already using that plugin but it seems to me you don’t know about this feature. I was looking for some of these. I find #8 and #10 are looking very good for me. Thanks for sharing. Nice list John, I am starting a new website whose design is still under construction. Looking for this kind of thing to get the under construction style on the website. Coming Soon Page & Maintenance Mode by SeedProd is a plugin that hides the rest of the site while you work on the production site. It’s just a coming soon page that lets you put basic info, logo and even contact forms. It blocks access to the rest of the site unless you are logged in. I don’t see how a theme could be any good for this type of task especially if people start to guess your urls such as contact or about. If found, they could serf the whole production site while under development. Great find… 🙂 Theme looks great and promising for new product launches..!